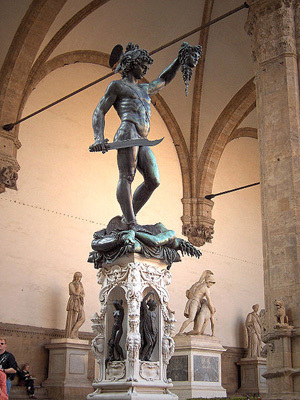 All Florence in One Day: Guided City Tour with Accademia and Uffizi Galleries. Piazzale Michelangelo, Duomo, Giotto Bell Tower, Baptistery, Accademia Gallery, Fiesole, Santa Croce, Piazza Signoria, Palazzo Vecchio, Loggia de’ Lanzi, Uffizi Gallery. The pre-booked, skip the line ticket allows priority entry over the general admission long line. Once the guided tour is over, it is possible to stay in the museum. P.S. Very Comfortable shoes suggested. 92 € – Book Now ! A remarkably valuable experience at a promotional price! Earphones are provided for groups of over 15 participants inside the museums. An expert local Guide will be with you all day to show the city. This is the best way to know a place thanks to the comments of who lives the city every day and knows it like no one else. In the morning, drive along the romantic Viale dei Colli up to Piazzale Michelangelo: a stop to admire the wonderful panorama of the city, one of the most beautiful in the world. The tour will proceed by coach through the old city centre. Then walking guided visit of the outdoor Duomo complex: the Baptistery with its bronze doors including the famous Porta del Paradiso and the visit of the Cathedral with the magnificent Cupola del Brunelleschi and Giotto’s bell tower. A short walk through the historic streets of the heart of Florence brings you to the renowned Galleria dell’Accademia* where you can admire the famous David by Michelangelo and other works by the great artist. In the afternoon, a fine coach tour offering panoramic views of the unparalleled beauty of Florence, taking in Fiesole, a delightful town of Etruscan origin set on the hills overlooking Florence and the Arno Valley. The tour continues to the old city centre for a visit to the Franciscan Church of Santa Croce (exterior). A short walk through the historic streets of the heart of Florence brings you to the famous Piazza Signoria, where you can admire the imposing Palazzo Vecchio (exterior) and the beautiful Loggia del Lanzi. The tour continues with a guided tour of the famous Galleria degli Uffizi** where you can admire the superb paintings of Botticelli, Michelangelo, Leonardo da Vinci, Raffaello, Giotto, Cimabue, Masaccio. * The Accademia Gallery is closed on Mondays and replaced with a visit to the: Medici Chapels or Bargello Museum. 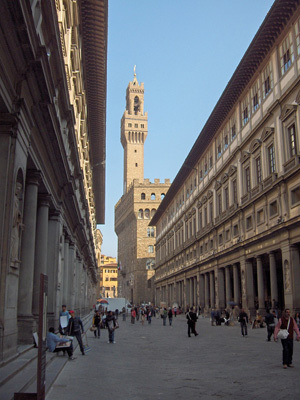 ** The Uffizi Gallery is closed on Mondays and replaced with a visit to the: Museum of Palazzo Vecchio (political headquarters and house of the Medici family). Earphones for a minimum of 15 pax at the Museum. 107 € – Book Now !